When Queen Lilioukalani succeeded her brother, King Kalakaua, in 1891, she was determined to revoke the Bayonet Constitution which had stripped him of his power and left the monarch a mere figurehead. The success of whites in dominating big business, the government, and land ownership angered her, as it did the majority of native Hawaiians. They would not allow themselves to be oppressed in their own country. As an intelligent and educated woman, Lilioukalani knew that attempting to oust the foreigners would be risky, but she had to try. One of her first steps was to replace her Cabinet members with native Hawaiians. The Americans were threatened by this, and a group of them formed the Annexation Club. Led by Lorrin Thurston, many of its members had been part of the Hawaiian League which had forced Kalakaua to sign the Bayonet Constitution. The Legislature voted out the queen's new Cabinet. Throughout 1892, she repeatedly appointed Hawaiian Cabinet members and the Legislature promptly voted them out for "lack of confidence." This happened at least seven times. Meanwhile, Lorrin Thurston visited Washington to solicit President Harrison's support for annexation of Hawaii. The President implied that he was in favor of it. With the two sides battling in the Legislature, the American members blocked bills on many important issues, hoping to bankrupt the country and force annexation. Lilioukalani fought them every step of the way: she drafted a new Constitution, restoring the monarchy's power, removing property qualifications for voting, and granting voting rights only to native Hawaiians. She planned to introduce the new Constitution on January 14, the last day of the Legislative sessions. Her Cabinet refused to sign it, however, claiming that they feared the opposition. Undeterred, the queen announced that she had a new Constitution ready, but was postponing its introduction on the advice of her Cabinet. Two of her Cabinet members had already leaked information about the document to the Annexation Club. They had immediately gone into action, forming the Committee of Safety and drafting papers setting up a provisional government. Queen Lilioukalani appealed to the United States Minister to Hawaii, John Stevens, for his support. He didn't give her any assurances; in fact, he was a chief collaborator in the plot against her. On January 16, several hundred of the queen's followers rallied in her support outside the palace. At the same time, the Committee of Safety appealed to Minister Stevens. They requested that he order U.S. Marines anchored off the coast to come ashore, ostensibly to "protect American lives and property." Stevens agreed, and the Marines were relocated to a station near the palace. The next day, Thurston asked Stevens to officially recognize the provisional government, with Supreme Court Justice Sanford Dole as its President. Of course, Stevens did, and the Marines seized control of the government buildings. To avoid armed combat, Queen Lilioukalani issued a statement relinquishing her throne under protest to the United States, until the United States government could review the matter and reinstate her. An American contingent traveled to Washington D.C. to request annexation. President Harrison officially recognized the new country. However, shortly thereafter Grover Cleveland was inaugurated as the new President. President Cleveland didn't share Harrison's views, and he appointed John Blount to go to Hawaii and investigate the revolution. In Hawaii, the Big Five (companies who controlled the sugar industry and much of Hawaiian business and government) courted Blount, presuming he'd protect their interests. 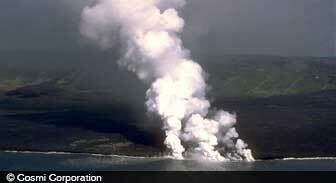 But instead, Blount compiled a mass of information from a wide cross section of Hawaiians. He came to the conclusion that Queen Lilioukalani had been deposed against her wishes, and that the majority of Hawaiian people supported her monarchy. Blount advised President Cleveland to support Lilioukalani. Cleveland fired Stevens from his position as Minister and replaced him with Albert Willis. Minister Willis presented Cleveland's offer to restore Lilioukalani to her position, if she granted full amnesty to those who overthrew her. Initially, she said that she would be satisfied with their permanent banishment instead of the customary death sentence for treason. Upon more reflection, she agreed to Cleveland's terms. Minister Willis visited Sanford Dole, advising him of Cleveland's request for the provisional government to step down. But the new government wasn't about to give up so easily, and they categorically denied the U.S. President's right to meddle in their affairs. Following this refusal, Cleveland presented the issue to Congress on December 18, 1893. He repudiated the forcible takeover of the throne and backed reinstating Queen Lilioukalani. He felt that the Hawaiian people should be allowed to choose their own form of government, and their choice was clear. It was now up to Congress to debate the matter. The provisional government lobbied hard against the restoration of the monarchy. In the end, Congress decided that whether the overthrow was just or not, the provisional government had been recognized as legitimate by President Harrison, so the issue would not be reviewed further. In July, 1894, the provisional government declared itself the Republic of Hawaii, with Sanford Dole as its President. Their plan was to bide their time until a more sympathetic U.S. administration was in place, then apply for annexation again. Meanwhile, those loyal to Lilioukalani's reign planned their own revolt. The former queen was even busy drafting a new Constitution for her return. But in early 1895, rumors of the plan prompted police to search for stockpiled weapons, leading to a shootout in which the Royalists were quickly defeated. Lilioukalani was placed under house arrest, tried for treason, and found guilty. She was first told that she and six others would be shot for their crimes. Soon after, papers of abdication were presented to her, and she was told signing them would stay the executions. While she was willing to die for her cause, she didn't want the blood of others on her head, so she signed the papers. Her house arrest lasted eight months. A period of parole followed, during which she was closely watched and prohibited from attending or holding any sort of gathering. Her parole ended in early 1896, but she was then forbidden to leaving Oahu. When that restriction was lifted later in the year, she immediately made plans to visit the United States. After visiting relatives and friends in San Francisco and Boston for the Christmas holidays, she and her contingent went to Washington. At a meeting with President Cleveland in February, 1897, she delivered a mass of documents relating to the revolution. She also thanked him for his attempts to reinstate her, acknowledging her understanding of how difficult the opposition had made it for him. In March, William McKinley's Presidential inauguration took place. Although Lilioukalani wanted to meet him, she felt that he wouldn't be a receptive audience with the overwhelming amount of issues and number people he had to deal with. There was also no annexation treaty on the table at that point. When Thurston and his cronies succeeded in getting a treaty to Congress in July, Lilioukalani promptly sent two of her representatives with a written protest. After its delivery to Secretary of State John Sherman, however, the document disappeared. Lilioukalani also paid an impromptu visit to President McKinley, and they had a cordial conversation. Unfortunately for her, McKinley supported the annexation. Congress passed the resolution to make Hawaii a U.S. territory in June, 1898. McKinley signed it a month later, dealing the Hawaiian monarchy its final death blow.